Want to tell Dave Szczygiel to take a hike? He’s likely to do just that. The Ann Arbor district’s environmental education consultant can be found most any weekday with a group of students visiting one of many area parks, wetlands and waterways. 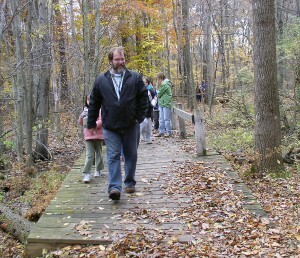 Ann Arbor Public Schools Environmental Consultant Dave Szczygiel leads Lakewood Elementary fourth-graders across a bridge at Waterloo as they look for signs of decomposition in the woods. On this day, he dips into his treasure chest of assorted dried fungi, antlers and laminated magazine clippings about outdoor adventures and calls upon his years of knowledge as a teacher and naturalist to keep the attention of a busload of Lakewood Elementary School fourth-graders. They were headed for the Discovery Center – and the wooded paths – at the 23,000-acre Waterloo State Recreation Area west of Ann Arbor. “Who knows what FBI stands for?” he queries. In his line of work, it’s not a widely known federal agency, but “fungus, bacteria and invertebrates,” he tells students. 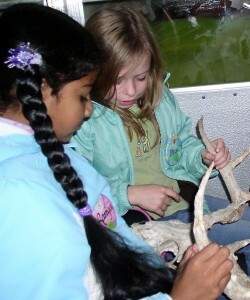 – Lakewood Elementary School fourth-graders look at a set of antlers as part of their environmental studies. Here, they are on a field trip to Waterloo State Recreation Area. The Ann Arbor Public Schools has had an Environmental Education program since 1959, founded by William B. Stapp with the help of Maxine Smith Miles, according to information from the district. The Ann Arbor program took off with the dedication of Stapp who wrote lessons plans for every grade level, said teacher Bill Browning who succeeded Stapp to run the program in 1968. Browning explained that Michigan was one of the leading states when environmental education first came on the scene and Ann Arbor’s K-12 program was the first of its kind in the country, according to district history. After Browning retired, Szczygiel moved into the post. He is a biology major who found education the best route to take for a guy who grew up around nature and worked summers as a naturalist for the YMCA. “You’d find me out there eating the hickory nuts,” he said of his childhood spent in the woods of Ann Arbor. 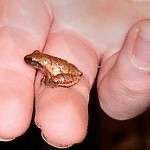 A student holds a spring peeper with care. Kate, a fourth-grader in Kalnaraups’ class, said her favorite part of the day was when the students jumped up and down in the bog area and watched the ground move. Students taste yellow birch bark at Waterloo as part of their outdoor adventure. Small groups of students are escorted around the park with Szczygiel and a team of volunteers who play a critical role. Regulars such as Jane Levy, a retired teacher who now is a beekeeper, and Tom Jameson, spend many days each school year taking groups of students on hikes with Szczygiel. Jameson said he helps with student field trips three to four days each week. Whether it’s first-graders learning about winter animals at Kensington Metropark or third-graders studying pond habitats, every student in grades kindergarten through six – about 400 classrooms – get a hands-on environmental lesson during the school year. He takes them to gravel pits, water-treatment facilities and into just about every park around the area. Fifth-graders get the thrill of a “winter survival” session where they build fires and cook their own hot lunch. Browning said he thinks environmental education has staying power, because it speaks to everyone. Casey Hans edits this e-newsletter for The Ann Arbor Public Schools. Contact her via e-mail at hansc@aaps.k12.mi.us or by calling 734-994-2090 ext. 51228. Environmental consultant and teacher Dave Szczygiel and planetarium director and physics teacher Steve Schaffer founded the AAPS Science and Environmental Education Endowment Fund through The Ann Arbor Area Community Foundation. It’s a way, Szczygiel said, to help keep environmental and science programs in Ann Arbor viable long term. To date, the endowment has about $115,000 and has a goal of raising $5 million to fund environmental education in the Ann Arbor schools in perpetuity. Short term, the fund helps defray transportation costs for environmental field trips. How many fourth-graders does it take to circle this 150-year-old tree? Lakewood students are finding out. • William B. Stapp began his work in the Ann Arbor Public Schools, where he established the environmental education program in 1959 and inspired many young people. He wrote lesson plans for all grades and oversaw the program for many years. It was the first comprehensive K-12 conservation and outdoor education program established in the United States, according to information from the district. He later became a professor at the University of Michigan. The William B. Stapp Award is given annually by the Michigan Alliance for Environmental and Outdoor Education to worthy educators. • In 1957 Maxine Smith Miles, who was active in the National Audubon Society, helped to integrate environmental concepts into The Ann Arbor Public Schools program by working with the Board of Education to initiate the program developed by William Stapp. She served as a volunteer for more than 30 years, guiding sixth-graders on nature and science excursions.